What does the recent Splendour! exhibition curated by the Georgian Group have in common with Pan’s Lodge ? …..a shared interest in the specialist craftsmanship and techniques of the 18th-century, used in our own work and by modern day craftsmen and practitioners whose work was showcased at Splendour! 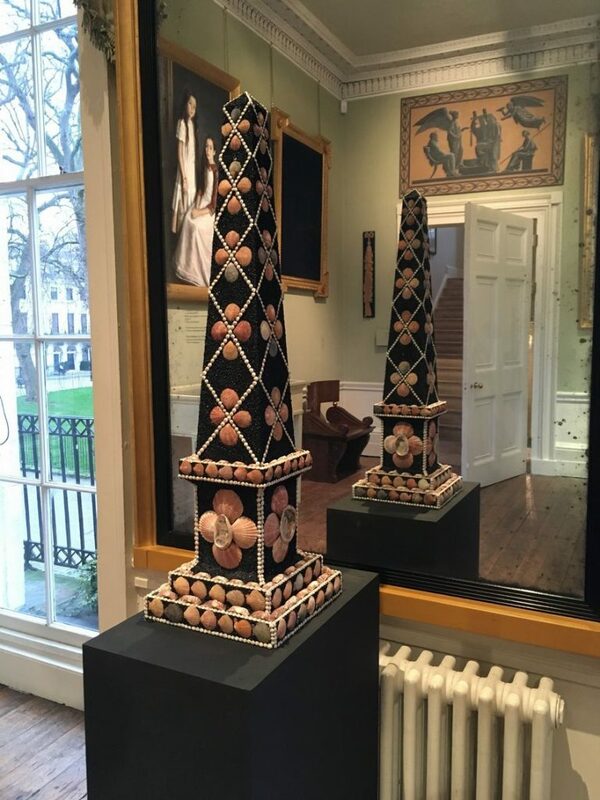 In February 2017, the Georgian Group opened its Fitzroy Square townhouse for an exhibition celebrating 80 years of conservation work by the charity. Looking forward, the exhibition displayed ‘Georgian’ crafts practised in the 21st century, showcasing a selection of artefacts such as architectural plaster and stone work, wood carving, joinery, block printed silk wallpapers and decorative shellwork. The entrance hall walls of the Fitzroy Square townhouse, home to the Georgian Group, are lined in plaster moulding elements. Over the past decade, we have been very fortunate to work with some of the practitioners and companies represented in Splendour! many of whom have been involved in significant restoration programmes throughout Britain in recent decades, and it was good to see current work by shellwork artist Tess Morley, silk-painted wallpaper panels by de Gournay and passementerie by Heritage Trimmings. It was also interesting to discover new craftsmen and women working in this specialist field, including students, apprentices and graduates who are continuing with the traditional skills and craft. Many of the specialist techniques and materials displayed, such as plaster, stone work and wood carving, are relevant to our own work designing interior architectural elements. 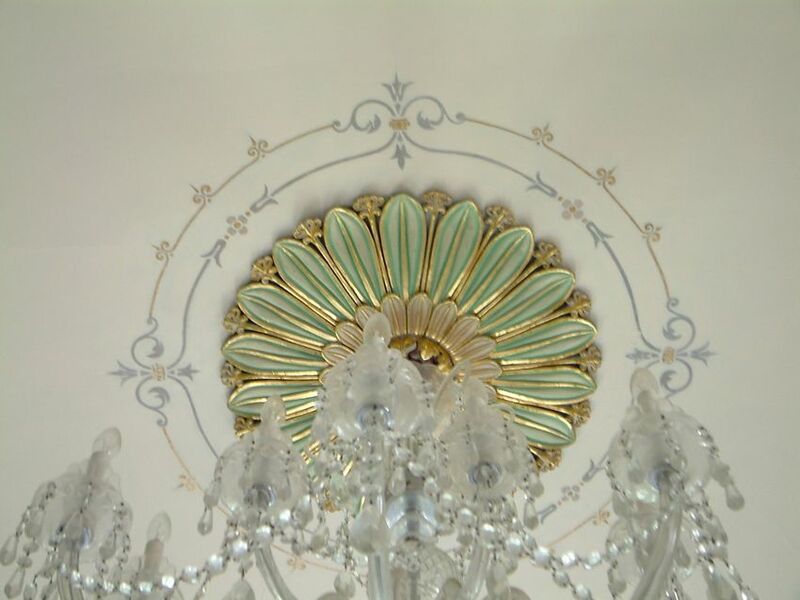 Some years ago, we were involved with the restoration of plaster mouldings, ceiling designs and interior elements for an important Grade I listed country house designed by the 18th century architect John Nash. Detail of the restored original ceiling centre attributed to 18th century architect John Nash. Our Georgian plaster ceiling centre is hand-cast, with 52 individual elements, from one of the original mouldings, and is now part of our Architectural Plaster Mouldings collection. 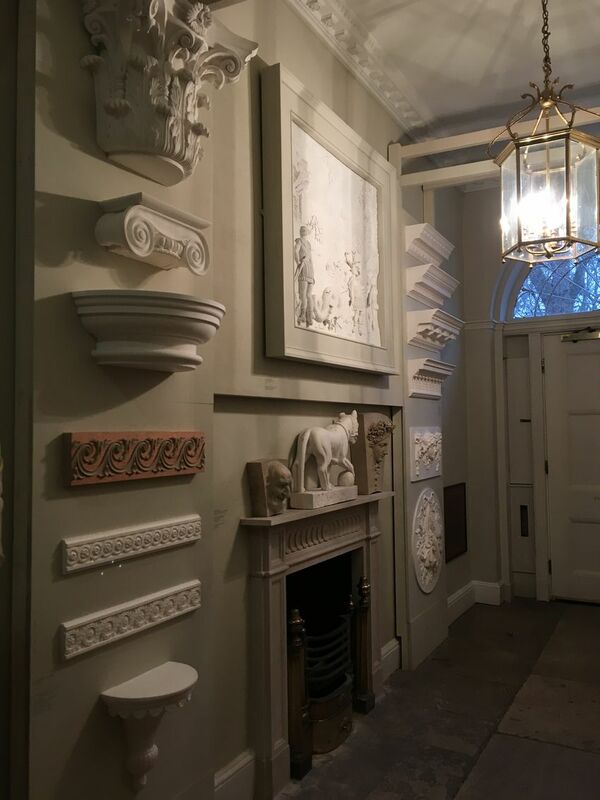 We have supplied this plaster enrichment, as well as other ‘Georgian’ inspired mouldings, to a number of period properties. The traditional wood carvings by contemporary wood carver Sarah Goss demonstrated the very best of British craftsmanship; her exquisite hand-carved flowers, tendrils, acanthus leaves and decorative plaques are reminiscent of the garlands, motifs and elements by master carver Grinling Gibbons. Gibbon’s distinct still life motifs incorporating garlands of fruits and flowers were the inspiration for our Flora hand-cast plaster frieze, originally designed and installed to an entrance hall in West Sussex and now available as a repeatable design or as a decorative wall plaque. 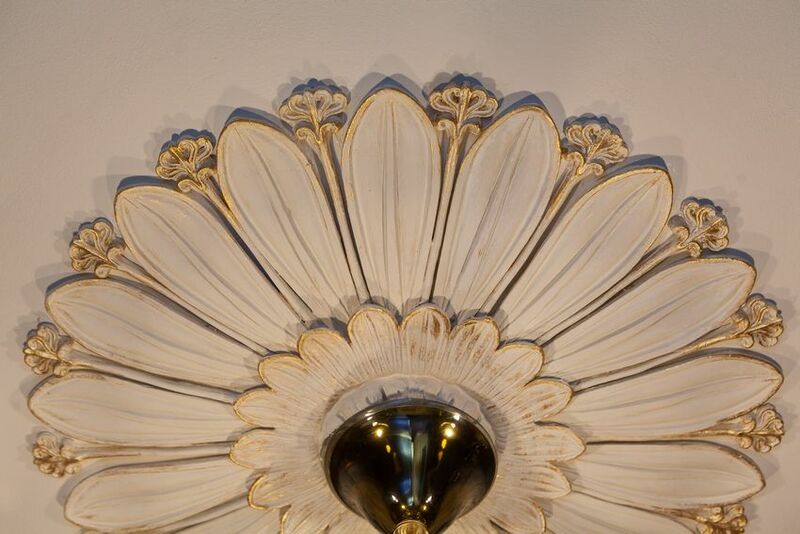 Inspired by the 18th century carvings of Grinling Gibbons, the Flora Plaster Frieze is a hand cast repeatable design incorporating flowers, fruit and decorative shellwork, and is now part of our Architectural Plaster Mouldings Collection. 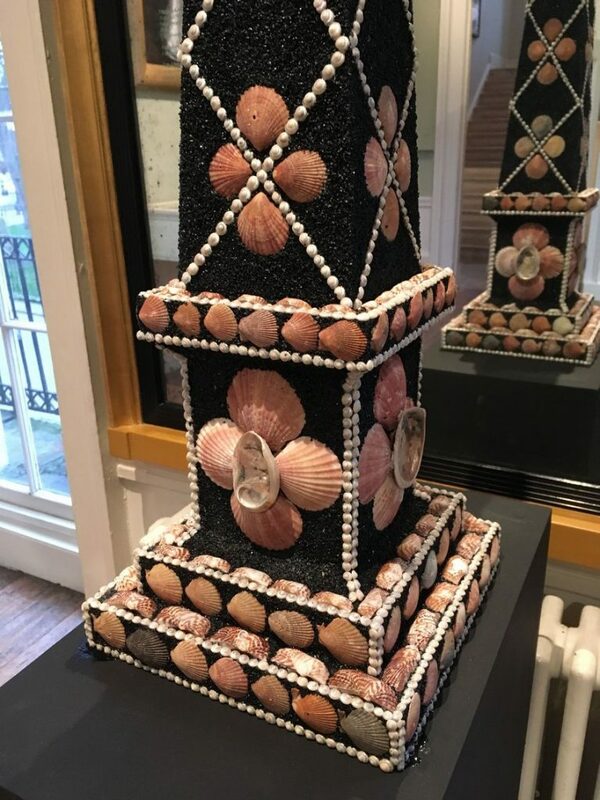 It was good to see the work of Tess Morley, one of Britain’s leading shellwork artists, whose work in the traditional style can be seen in the recent restoration of the Grotto at Goodwood House. We first discovered Tess’s work through a Country Life article when working on the book The Grand Tour Collections, 2005, in which we used some of her pieces in various installations to illustrate the 18th century’s fascination for the natural world and shellwork; this is evident in the decorative treatment of Shell houses, pavilions and grottoes found within the Georgian landscape. The pair of shell obelisks and grotesque masks displayed at Splendour! highlights the Georgian period’s fascination for intricate decorative shellwork, taking its original inspiration from the artificial caves and grottoes of Renaissance gardens. 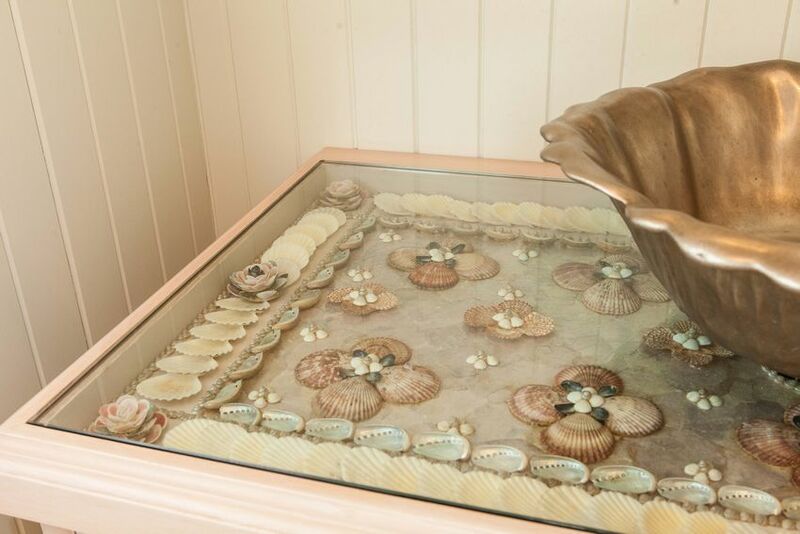 We have also worked with Tess on the commission of a bespoke shellwork cabinet, decorated in her distinct style using oyster shells, scallop shells and cowries. Finally, the exquisite, painted panels by London-based company de Gournay perfectly complimented the craftsmanship seen throughout the exhibition. De Gournay’s distinct chinoiserie style encapsulates the painted paper and silk wall paper hangings that were popular in the Georgian period. Last year, we installed an interior scheme incorporating interior architectural elements – dado height panelling, internal doors and fitted cabinetry designed in a Georgian style. Installation was completed with hand decoration and gilt accents, and finished with De Gournay chinoiserie silk wallpaper hangings embellished with gold leaf. 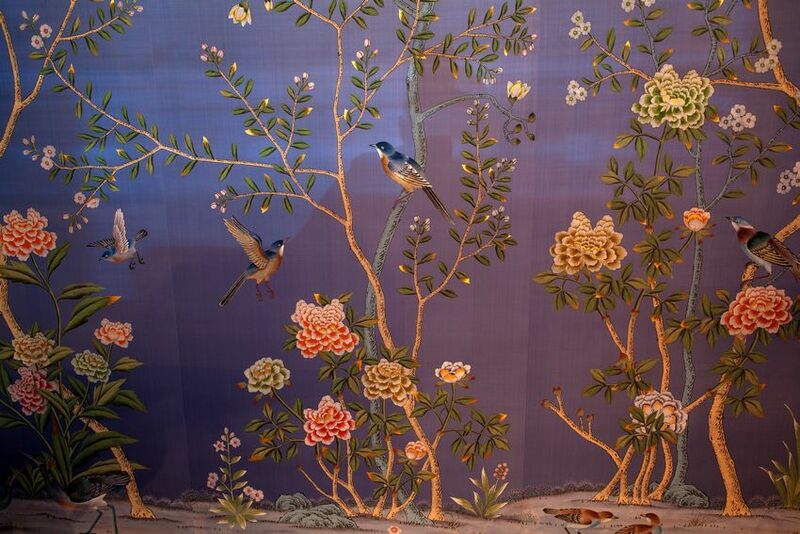 De Gournay chinoiserie silk wallpaper hangings embellished with gold leaf. Installed by Pan’s Lodge to a Private Residence. We hope you’ve enjoyed reading this article about Splendour! Art in Living Craftsmanship and how the Georgian period has informed our work at Pan’s Lodge. If you would like further information about exhibitors, please contact the Georgian Group. We highly recommend reading the publication that accompanied the exhibition, which provides excellent essays about the society’s conservation work and a biography of each of the exhibitors. If you would like to see more of our work or view our interior architectural collections, please take a look around our updated website, continue to read our blog or follow us on Instagram.